Summary: Paul Dini’s Jingle Belle comes to Top Cow in a special ‘Halloween collides with Christmas’ one-shot written by Dini and drawn by Stephanie Gladden (Powerpuff Girls, Chowder, Hopster’s Tracks). In years past, Santa has triumphed over a variety of enemies including the Devil himself. 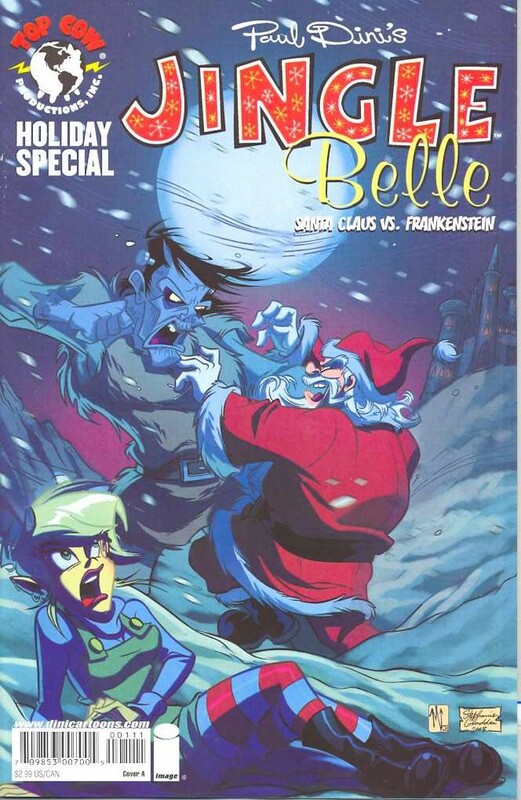 Now, St. Nick gets ready to face his greatest challenge ever in Jingle Belle: Santa Claus Vs. Frankenstein! Inspired by Mary Shelly’s original novel (sort of), the story of Frankenstein’s monster takes a new twist when he is found by Jingle in the Arctic wastes and ‘rehabilitated’ to fit in with the elves at Santa’s Workshop. All goes well until an ultra-PC city declares Santa Claus taboo and awakens Frankie’s monsterous side in an misguided attempt to help his friend. It’s up to an ailing Santa and a reluctant Jingle Belle to stop their monstrous ‘apprentice’ before he destroys the town and ruins the reputation of Christmas forever! Sorry this is a bit late, but I figured what the heck it’s Christmas and did another recap of one of my favorite holiday/horror related comics. Jingle Belle is a series of different comics about the misadventures of Santa Claus’s bratty but well meaning teenage (by elf years) daughter. Hey, just because your dad’s Santa doesn’t mean you’re a little angel. Her best friend also happens to be the official Halloween witch. Unfortunately, I only own two comics starring Jing, this one and one involving her uncle Krampus. I’ll save that one for next year.